A bit of wordplay for the actual win of the night. Comedic glam metal band, Steel Panther, made a surprise appearance during FOX’s Thursday Night Football broadcast of the Steelers vs. Panthers game. For a bit of taped fun during the broadcast, the band ‘mistakenly’ turn up to FOX studios, revealing they were they were told they were headlining Thursday Night Football. Unfortunately, Michael Strahan has to correct them, telling them the game is “Steelers-Panthers,” and that they wouldn’t be getting a headlining set. While we don’t get a Steel Panther performance, we are treated to a bit of the FOX football theme music from guitarist Satchel and glam metal dress up from FOX analyst Terry Bradshaw! Though Steel Panther didn’t get their headline set during Thursday Night Football, you can catch a scheduled set during their upcoming US tour this winter. Grab tickets and see their full list of tour dates here. 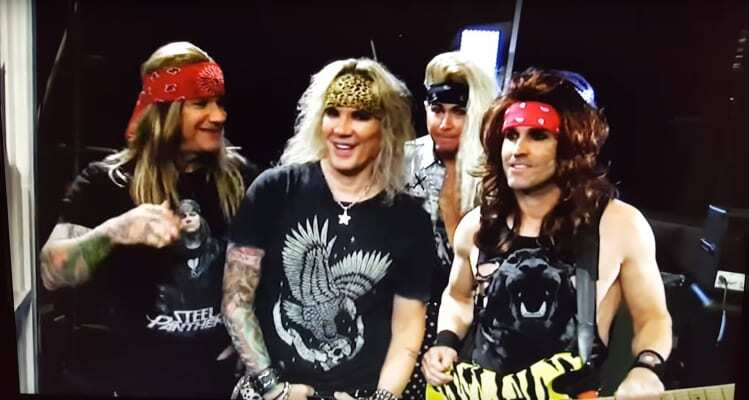 Did you see Steel Panther’s surprise appearance live during the game? Let us know in the comments!